Application process takes approximately 30 minutes. Waiting Period: There is a mandatory 3-day (calendar day) waiting period before the license becomes valid. The 3 day waiting period begins on the date of application. No exceptions can be made. Location of Ceremony: A license obtained in any Washington county is valid anywhere in the state. Public Record: All marriage applications and certificates are a matter of public record. Once a marriage has been recorded it cannot be unrecorded. State law requires that at least two witnesses be present at the ceremony. Witnesses should be at least 12 years of age. State law prescribes who can perform a marriage ceremony: See RCW 26.04.050 for a complete list. Certified copies of marriage licenses must be requested. Requests may be made in person or by mail. 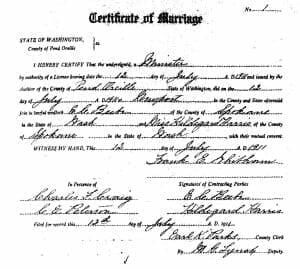 All public documents, including marriage certificates, are available from the Recording Department.